Once again, we are taking a closer look at a product made by the titans at Young Living. This time, we are going to focus on a household cleaner from their Thieves product line. If you are a person who loves a clean smelling home or office but isn’t a big fan of all the chemicals used in most household and industrial cleaners, then you will want to keep reading because this cleaner might be what you need. ​What Are People Are Saying? ​Who Should Purchase This Product? 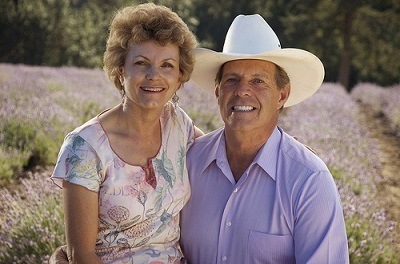 This company, whose primary focus is essential oils, their extraction, and offering the purest products on the market, began their mission of bringing top grade essential oils to the world back in the early 90s, and since then, the Youngs, who consisted of Gary and Mary at the head, have built an empire on the extracts of plants from around the world. Unfortunately, founder Gary Young passed away in May of 2018, but he left behind a legacy of ideologies and beliefs in the healing properties of aromatherapy. It was their commitment as a couple that has generated them millions of wellness experts and loyal fans. I have several of the products in this specialty line. I am fortunate enough to acquire and test them for myself. I have the oil, the toothpaste, the foaming hand soap, and the household cleaning solution, which we are covering today. The name is derived from a story of some burglars in 15th century France. They were arrested when it was discovered they were robbing people at home who are sick with the bubonic plague. But how were they pulling it off and not contracting the illness? Interestingly enough, the authorities found out they were covering themselves in a blend of botanicals that included clove and rosemary mixed with vinegar. Their concoction worked so well that they were offered a lighter sentence for giving up the recipe. Today, this essential oil giant sells an entire line of products that use these same essential oils and a few more. I am going to briefly cover all the ingredients of Thieves household cleaner. It should be noted that even though there are different components in their products, this cleaner uses the same oil blend we know as Thieves. Water: We all know what this is, so there isn’t much need to go further into detail on this one. Alkyl Polyglucoside: Wait? That sounds like a chemical to me. It is. In fact, it’s a chemical compound used in a variety of cleaning solutions. This is because it isn’t a toxic chemical and biodegrades. Humans and animals are safe if exposed to it, which is fine by me. Sodium Methyl 2-Sulfolaurate: Also a chemical. But is also non-toxic. Disodium 2-Sulfolaurate: A non-toxic chemical compound. Thieves [Eugenia Caryophyllus† (Clove) Bud Oil: An essential oil they make. Citrus Limon† (Lemon) Peel Oil: Same as above. Cinnamomum Zeylanicum† (Cinnamon) Bark Oil: Same as above. Eucalyptus Radiata† Leaf Oil: Same as above. Rosmarinus Officinalis† (Rosemary) Leaf Oil): Same as above. Tetrasodium Glutamate Diacetate: A non-toxic chemical compound. So, it seems that, even though there are chemical compounds in this household cleaner, they are all non-toxic and safe for humans, animals, and the environment. These compounds are also natural, not synthetic, according to their website. As for the essential oils they use to create their signature scent, they are all available as singles and some even in their Vitality series, which indicates that it is intended for culinary usage and as a dietary supplement. This product does exactly what the words on the label says. It cleans. What does it clean? Anything really. You can use it for spot cleaning or deep scrubbing on pretty much any surface or fabric in your home. Although, we would highly recommend you dilute it correctly and do a spot check on any fabric before applying liberally. This goes for wood, plastic, and granite as well. How Do You Dilute It? You should put about one capful of cleaner for every two to three cups of water. This is the heavy cleaning ratio so you can dilute it even more if the scent or formula seems too strong. If you are looking to clean mirrors or windows, then you should mix one capful with five drops of Citrus Fresh essential oil blend and then add that to 3 cups of water. Top it off with one teaspoon of white vinegar for a great glass cleaner. There are extensive dilution ratios on the label, and this brand is not for internal consumption. Keep out of the reach of your children, and it should be stored in a cool dark place. Besides the essential oil blend, there is the Vitality blend, which is made to be used as a dietary supplement. They also make dish soap, dishwasher powder, veggie soak, veggie spray, laundry detergent, spray, wipes, toothpaste, mouthwash, and foaming hand soap. We went through two bottles of the latter, and I can say I’ve never had a better hand cleaner. I have been using this cleaning solution for a few months now and have to say, it does an amazing job. I use it on the tile floors and the kitchen countertops. I just dilute it in a spray bottle with some water according to the dilution directions on the bottle. This bottle has been a mainstay on my kitchen countertop when I’m cleaning since I first tried it and plan on keeping a bottle under my sink from here on out. Of the customers reviewed, the majority of them are in love with this cleaner. They report that it smells amazing, which it truly does, and that it cleans well, which it does greatly as well. People who have purchased, used, and reviewed this cleaner are nearly unanimous in their shining ratings of this cleaner. There were some negative reviews, which is typical since it is a belief of mine that there is always one person to complain. The biggest complaint that I could find was that some bottles came to their destination leaking. One consumer said that it didn’t clean grease as much as she would have liked. I have to admit that when I used it to mop up a spill of pasta salad on the floor, the oil wasn’t lifted up as easily as I would have liked. For me though, if it takes a little elbow grease to get something clean, I’d prefer it than putting harmful chemicals into the air or down my drain. This cleaner is great for environmentalists, people who want to live “green”, essential oil fans, and anyone who likes the scent of cinnamon, clove, eucalyptus, and lemon. They should give this cleaner a try. If you are tired of strong smelling ammonia and bleach, then you are perfect for this product. This product is great. 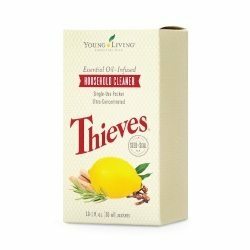 I know this first hand, as I’ve said earlier, and I think it could serve as a starting point for you to introduce yourself to the entire Thieves line by Young Living. As a proud owner of this product, I can honestly attest to the amazing smell and its ability to clean. 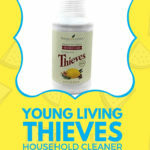 If you use Thieves Cleaner or any of their other products, then please leave us a comment in the section below. If you think this article would be helpful to a friend or acquaintance, please feel free to share it with them.